Security number 271 is required for the user to see the Student Information control. A student will only see them-self in the selection drop-down. Families will be able to select students associated with their family key. Staff will be able to select all students. 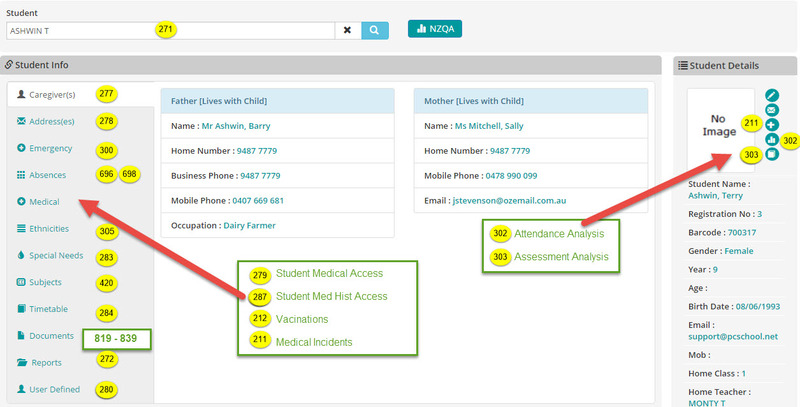 Once the Student Information control is opened, the aspects of what can be seen are revealed by having the associated security. It is advised that Security 211 is only given to medical staff as it enables the entry of Medical Incidents. A summary of these can be seen with Security 287.